Honda is a Japanese manufacturer of both autos and motorcycles, as well as engines for a variety of applications. Honda is the second largest Japanese auto maker behind Toyota. Honda also owns luxury brand Acura. 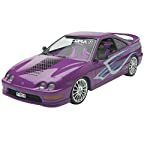 Honda is known for making great cars and has some model builder's favorites like Civic and Prelude.